This hearty winter veggie salad is a meal all on its own. Perfect for feeding a hungry family, it also doubles as a wicked starter or side dish if you’re entertaining. 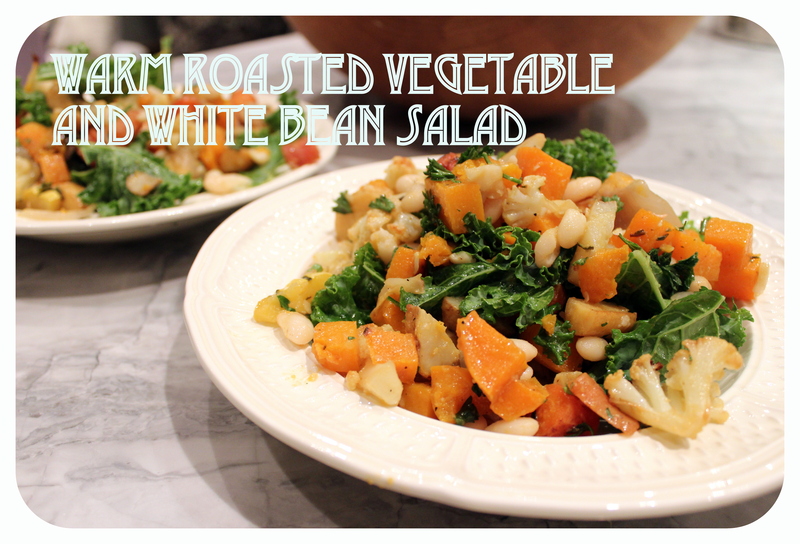 The salad features some of my favorite root vegetables and a maple-dijon and citrus dressing. Of course feel free to make it your own by using your family’s faves. Preheat oven to 425 F. Meanwhile, wash and chop your veggies and place them in a large mixing bowl along with the herbs (still on their stems). Mix your dressing by whisking together all liquid ingredients minus the sherry vinegar; season with salt and pepper. Pour half of the dressing over the mixed veggies and toss gently to combine (reserve the other half). Arrange veggies into a single layer on 2 baking sheets. Roast for 30 minutes, tossing half way through. Next, whisk the sherry vinegar into the reserved dressing. When the veggies are done, find your herbs and gently crumble the leaves over the veggies; transfer everything to a large mixing bowl, add the beans, parsley, kale (if using) and dressing. Toss gently to combine and serve while everything is still warm. This entry was tagged dinner, lunch, side dish, Starter, toddler, Vegan, Vegetarian. Bookmark the permalink.